Now, Jynx is the reason for the problem with this episode. Jynx is vaguely female-person-shaped, and has black skin with big eyes and giant pink lips. Yeah, you probably know why this episode isn’t aired now. It’s unclear how much blackface iconography contributed to the design, but actually the fact that these Jynx are Santa’s helpers implies that the connection is intentional. (See Black Pete.) In later anime seasons and later games, Jynx is purple to sidestep this. Anyway, Ash sends in Pikachu and then Charmander to fight the Jynx and tries to catch it. It doesn’t work, and Brock and Misty speculate that it might have a trainer already and just be lost. The Jynx comes over and tries to express a need for help, and helpfully the boot has a picture of Santa inside, indicating that of course, the Pokémon belongs to Santa. Then Ash pulls the raft for a while, but he gets tired too. They are rescued by a Lapras, a big friendly telepathic water Pokémon, who pulls them the rest of the way. Meanwhile, Team Rocket is following in a pedal-powered submarine. It’s really unclear why they decided to go look for Santa instead of just waiting with the trap like they said they were going to. Everyone arrives and Santa is reunited with his boot and his Jynx. Team Rocket take Santa hostage, forcing the (multiple) Jynxes to load all the gifts into their submarine. It comes out that the Jynx who took Jessie’s doll all those years ago was just going to fix it and bring it back, but she stopped believing in Santa, so he couldn’t return it. She declares that they’re stealing all the gifts anyway, but the submarine is frozen with them inside by Lapras. Then Ash stupidly fries them with Charmander, but that just melts the ice. Then Santa calls on the Jynx army and they use crazy powerful psychic powers to levitate the sub, shake all the gifts back out, and fling Team Rocket into space. One wonders why they didn’t do that in the first place. One wonders a lot of things about this show. I always thought there should be a rights-for-Pokémon revolution. It’s more than a little screwed up that children are encouraged to roam the countryside to capture and train sentient creatures to fight each other. 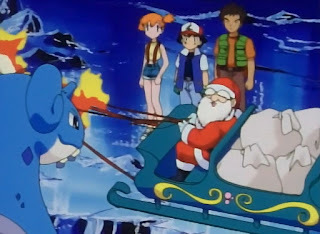 Anywho, Santa heads off to bring presents to the world, and Team Rocket gets a sleep spell, courtesy of a Jynx. The End. Even putting aside the kind-of-racist, definitely weird character design, this isn’t an especially interesting or good episode.